Style, for me, is a highly debatable subject. I'm convinced, just from mere observation, that most people don'thave much when it comes to fashion style, or taste for that matter. Do some observation of your own and I'm sure you'll agree with me. In a day, are you able to count on one hand how many truly stylish women you see? I didn't think so. Most will be wearing ill-fitting pants, a far-too-tight top, cheap and nasty accessories, and often, far too much make-up, as well as ghastly hairstyles. At times, I hasten to add, I include myself, especially now that I am completely broke. I loved the quote in the book by Edna Woolman Chase: "Fashion can be bought. Style one must possess." I couldn't agree more. Something I think and say often of fashion, and which author Nina Garcia echoes, is "If the trend is to wear bright yellow mini-dresses, and you don't look good in yellow or mini-dresses, why would you buy one?" I just don't get this. It's so obvious. This book will help you identify fashion faux pas (although not entirely your own personal wrong doings or how to fix them as such), how to edit your closet and how to build a wardrobe (a stylish and useful one), as well as a little fashion history. Of course fashion is not just "clothes", but also shoes, bags, jewelry, and more. Also interesting are the ideas given by many in the fashion world - great hints and tips. If I had the money, I'd have a tailor. I prefer made-to-order clothes rather than store-bought, but then again, how many seamstresses are there in your neighborhood? 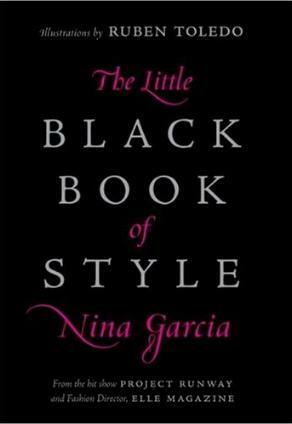 Nancy Garcia is a fashion judge on Bravo's Project Runway and a fashion director at Elle magazine. She knows her onions does Ms. Garcia. I loved the delightful sketches throughout the book. Conclusion - If you want to know what style is, read this book.